Casual Dinnerware Sets are Fun! I love changing my kitchen décor by coordinating with casual dinnerware sets that we use as everyday dinnerware. Redecorating the kitchen is therapeutic to me. If I'm feeling depressed or stressed out, I redecorate the kitchen. It would probably be less expensive and more productive to pull weeds or something, but hey, that's me! Currently I have my eyes on the Spode Baking Days Collection . I think it would brighten my days. 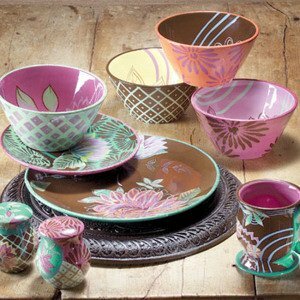 Shop for Casual Dinnerware - Awesome Selections! If you are looking for a set for everyday use, you will benefit from these tips for selecting a casual dinnerware set. Modern dinnerware is always stylish and ideal for casual dining. It is also good to know that porcelain dinnerware is available in casual patterns and is becoming a preference to consumers because of the high-quality of the material. Rachael Ray is beyond practical in her cooking and choices of dinnerware and cookware. Rachael Ray dinnerware definitely fits into the casual line of dinnerware. Pfaltzgraff dinnerware sets also fall in the realm of casual dinnerware. The patterns are plentiful and very trendy. Most casual sets come in a 16-piece dinnerware set although there are recent offerings of 18-piece dinnerware sets. A lot of casual dinnerware features patterns such roosters , apples , sunflowers and so forth. Some people like solid-colored casual dinnerware such as Fiesta dinnerware . 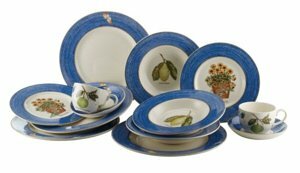 Blue Willow dinnerware seems like it will never die out of popularity. 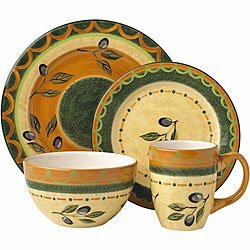 Southwestern dinnerware and pottery dinnerware is much in demand here in New Mexico as well as western dinnerware. Melamine dinnerware sets are perfect for a growing family with small children running around and ceramic dinnerware is also pretty durable as well as dinnerware stoneware casual. My first set of casual dinnerware was covered with strawberries. My mom collected the set from a grocery store promotion and I kept it in my hope chest for years until I got my own place. Over the years my mom and I made ceramic accessories for my first kitchen and she bought pink glassware to go along with it and gave it to me for birthdays and Christmas. I even had dish towels, runs, curtains and so forth. My second kitchen set was all apples including canisters, mirrors, shelves, paper towel holder, garbage can, potato box… everything had apples on it. After I got rid of it, I knew that I had an obsession for dishes, so I bought clear glass dinnerware so I could easily change the accessories without changing dinnerware. That didn't last long. I like a lot of color. Currently my dishes are green and white and I'm contemplating what my next kitchen will look like. I'm seeing polka dots!